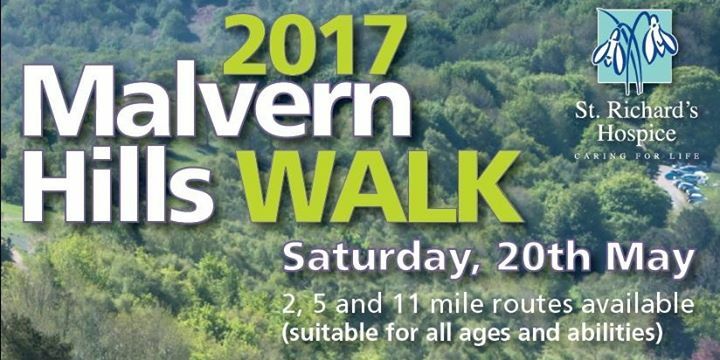 Now in its 33rd year, this event is fondly held in the hearts of St Richard’s supporters who walk the iconic Malvern Hills each year. Suitable for walkers of all ages, there is a choice of 11 miles, 5 mile or 2 mile routes. Register from 9am until 10am at Blackhills Carpark WR13 6DW. We will see all walkers who have pre-registered for the 11 mile walk at 8am at North Quarry car park WR14 4LX, where the first coach leaves at 7.30am, last coach at 8.30am to take you to the start of the walk. Please remember to bring a water bottle, have a good pair of walking boots and you may even need some suncream! We would love you to tweet your pictures @StRichardsHosp ‪#‎malvernhillswalk‬. Please note the car park fee is £4. Thanks to everyone for your support, have a great day! This event is to help fund our free care and support to patients and families across Worcestershire so we ask you to pledge to raise sponsorship of £50 or more. Please call the fundraising department on 01905 763 963 or email appeals@strichards.org.uk if you need anything further.